Editor’s note: How the 2018 GMC Canyon Denali performed in a comparison by Trucks.com and mountain bike enthusiasts with the Toyota Sequoia, Range Rover Velar and Subaru Ascent on a round trip from Los Angeles to Santa Cruz, Calif. Find the other vehicles and the full report here. The GMC Canyon is a versatile midsize pickup truck that proved itself an able partner for a mountain biking vacation and other trips where hauling equipment for outdoor adventures is a priority. The Colorado was one of a small group of vehicles Trucks.com tested during a recent round trip to Santa Cruz, Calif., to team with a cadre of mountain biking enthusiasts. Trucks.com leveraged the bikers combined experience to identify the perfect transport to mountain biking trails. The other vehicles included a 2019 Subaru Ascent, 2018 Range Rover Velar and 2018 Toyota Sequoia. The test vehicle for the 800-mile trip was a Canyon Denali 4×4 Crew Cab with a 128.3-inch wheelbase. The Canyon has a suggested starting price of $22,095 including a $995 destination charge. The vehicle Trucks.com tested was a top-of-the-line Denali version with options that brought its suggested price to $45,935, including the destination fee. That price ventures into full-size pickup territory. Buyers looking to save money should consider bypassing the luxury Denali trim or the Canyon’s slightly less expensive Chevrolet Colorado pickup truck sibling. The Canyon is powered by a normally aspirated 3.6-liter V-6 engine with 308 horsepower and 275 pound-feet of torque. The engine is mated to an eight-speed automatic transmission. The powertrain proved itself in the multifaceted test that included hauling bikes up steep grades on challenging two-lane roads. Even with three adults aboard and a bed full of bikes, the Canyon always felt more than adequate for the task. The pickup truck configuration and the test vehicle’s features were suited to long drives both on the highway and in rugged, off-road conditions. “I like how high up I am. I feel very powerful, and I can see above everyone. 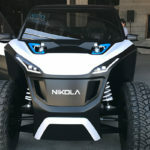 But it doesn’t seem so overpowering that I’m intimidated to drive this thing,” said Evan Soroka, a yoga instructor from Aspen, Colo.
“It has great power. I was really surprised and impressed with the amount of power and responsiveness of giving it gas,” said Kayley Burdine, a pro mountain biker and fitness instructor from Mobile, Ala. The Trucks.com team and mountain bikers found that the Canyon was an excellent choice for transport to a mountain biking adventure. The only qualm was the limited inside storage. The GMC Canyon Denali included an abbreviated set of electronic driver assists, lacking some systems, like adaptive cruise control, that should be included in a vehicle priced at nearly $46,000. Hill-descent control and a terrain response system also were notably absent. One highly valued feature was the backup camera system that offered a clear and useful view on its 8-inch screen. At times, however, the camera lens was covered by a tailgate pad system that provided a convenient way to transport several mountain bikes. The team had mixed feelings about the lane-assist system that sent out a series beeps if they deviated from the marked lane. “It’s nice that it’s reminding me that I keep crossing the lanes. But I think, at a certain point, that might get annoying because I have a pretty good idea of where I’m at,” Soroka said. The Canyon’s up-level Denali trim interior gathered unanimous praise. “I really do like the [cooled] seats, especially for mountain biking, because you’re going to be in the hot sun, sweating all day, using your body. It’s nice to jump back in the truck and be able to have some cool-down on your seat,” said Justin Mayers, a mountain biker and skier from Jackson, Wyo. The Canyon, a crew cab model, had four full-size doors and seat belts for five passengers. But cramming five people into the truck for more than a short trip is a stretch. Accommodations for the front-seat passengers were plush. But back-seat passengers found the seatback too upright to be comfortable for long drives. With four bikes in the truck bed and four adults in the cab, lockable interior storage space is extremely limited. The chrome running boards received mixed reviews. They provided easier roof access for shorter people. But others thought they got in the way. “I think the running boards on this Denali look like they’re off like an F150. They’re not clean and molded to the body properly,” said Bryon Dorr, a mountain biker and outdoor adventurer from Reno, Nev. The group liked its overall handling and off-road ability for access to remote trailheads. “I think the size works really well. You know where the ends of this truck are at all times. Placing this car where you want it, on or off road, is really, really easy and direct,” Dorr said. The truck is rated by the Environmental Protection Agency at 17 mpg in city driving, 24 mpg on the highway and 19 mpg overall. That calculates to about $17.50 in fuel to drive every 100 miles on a mix of high-traffic city streets, long stretches of Interstate highway and curvy mountain roads. The Canyon was last redesigned for the 2015 model year. Midsize pickup trucks have extremely long model lives, so the Canyon is expected to remain in the current form for several more years. An appearance change “refresh” is expected for 2020.